Beijing has justified its efforts to evict tenants city-wide as the city removes safety hazards following last week's suburban fire that killed 19 people. A front-page commentary on Friday's Beijing Daily, the municipal Party committee's mouthpiece, denies the city government is targeting its "low-end population," in reference to migrant workers. The evictions have sparked widespread criticism that migrant workers should not be blamed for the fire and that forced evictions in sub-zero temperatures are heartless. However, the commentary, which stressed that "life and safety are always the red line of a city's development," claims the perception that the hazard removal campaign is aimed at "rejecting the low-end population" is a misunderstanding. In Beijing, illegal buildings as well as places that are simultaneously used for housing, storage and production are among the places with a high frequency of safety incidents, said the commentary. The campaign targets illegal buildings and safety hazards, it said, adding that the fire proves that "it's time for real and tough action, and those that should be punished, suspended, seized or detained must be dealt with accordingly." Police have detained 18 people suspected of being involved in the fire that killed 19, including 8 minors, in an apartment block in Xinjian village, Daxing district on November 18. More than 400 people who lived in the apartment block have been relocated, He Rui, Daxing district's deputy chief, told a press briefing on Monday. Beijing has since rolled out a 40-day city-wide safety check, with district governments setting strict deadlines for tenants to move out of illegal buildings. Most shops and houses in Xinjian village were closed on Friday, with garbage piling up along the streets, as tenants told the Global Times that Friday was the last day they could stay, or water and electricity would be turned off if they don't move out. An owner of a clothing manufacturing plant said that they were woken up on Friday morning and told to leave by night. More than 40 of his workers will follow the factory to Langfang, Hebei Province, the owner said. Other villagers said they were told to move a week ahead of Friday. A fruit vendor in Xinjian said that he is returning to his hometown Handan, North China's Hebei Province 450 kilometers away from Beijing. He was carrying boxes of fruit and personal belongings on an electric tricycle. "I have to be quick. Today is the last day for us to move," he said. A middle-aged woman from a village near Xinjian said that almost all the rented houses in her village were empty, and some people who could not find another home on short notice slept in the streets. Weather forecasters said the lowest temperature in Beijing at night this week would be around -4C. Several real estate companies have grabbed the chance to promote their apartments to migrants and local citizens in the village on Friday. Security company employees also showed up, pasting their employment opportunities on walls. They said they offer a good salary and free accommodations in hopes of attracting migrants who might lose their job during the illegal building inspection. The streets were dotted with furniture movers. Scavengers entered unlocked stores and houses to pick up items left behind. Beijingers in the village were also affected by the campaign, with a senior citizen saying life will be very inconvenient after the migrant workers move out, as he needs to go downtown every week for groceries. 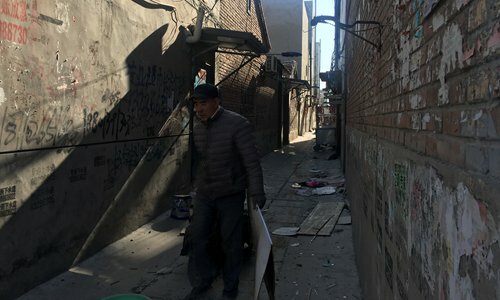 The campaign has been widely criticized as targeting the so-called "low-end population," mostly migrant workers living under shabby conditions, who are being hastily driven out of their apartments in sub-zero temperatures. "I understand the rationale, but its implementation is rude and inconsiderate. It would be better to increase the number of government-subsidized rental houses to migrant workers than to drive them out," a 35-year-old woman surnamed Huang, who came to work in Beijing from Central China's Henan Province in 2002, told the Global Times on Friday. Aside from calling the term "low-end population" as offensive, many Net users also said that the government should require companies to offer safe homes to their employees. The term was seen in media commentaries after Beijing vowed to transfer what it called "low-end industry" years ago. The implementation of the policy also triggered criticism as early as 2010, when a People's Daily commentary said driving away the "low-end" workers is a conceited idea that would make city life much more inconvenient. "Beijing's rapid urbanization and modernization could not be possible without the efforts of the 'low-end population,' and once they are gone, the city's competitiveness would drop sharply," said a widely circulated online post entitled, "What's the fault of 'low-end population.'"